Aristotle was among the most influential individuals who ever lived, and his contributions span the entire range of human experiences. Moreover, he originated entire new fields of study, and, for some two millennia, he was venerated as a quasi-religious authority, during which time his writings on living organisms were accepted as indisputable facts. He was born in Stagira in north Greece in 384 BCE, son of the court physician to the Macedonian royal family. After studying medicine, he was a pupil of Plato and tutored Alexander the Great. Aristotle established a school, the Lyceum, in Athens in 335 BCE, and remained its director until 323 BCE, when he was succeeded by his student, Theophrastus, the father of botany. Among the fields of study Aristotle created was biology; up to one-third of his surviving writings are devoted to this subject. Many of his facts have been validated, but some were wrong—in particular, those dealing with the human body. He introduced the scientific method, conducting research based on observation and experimentation prior to formulating explanations. He maintained records on more than 500 species of animals he studied, including remarkably accurate descriptions of marine invertebrates. He examined fertilized eggs at different stages of development, and formulated the theory of epigenesis­—that organs develop in a specific order. Aristotle drew a distinction between homologous and analogous body parts, predating Richard Owen by over twenty centuries. In his monumental work, The History of Animals, Aristotle was first to classify animals into groups based on the similarities and differences of their physiology. Animals were grouped into those with blood (vertebrates) and without blood (invertebrates). He compared organs from different species and noted how they varied depending upon habitat. His Great Chain of Being classified living organisms into eleven levels, based on their scale of perfection at the time of their birth and nature of their souls; humans were at its apex, plants at the base, and a hierarchy of nature only improved upon in the eighteenth century by Linnaeus. SEE ALSO: Botany (c. 320 BCE), Scientific Method (1620), Linnaean Classification of Species (1735), Theories of Germination (1759), Homology versus Analogy (1843), Embryonic Induction (1924), Phylogenetic Systematics (1950), Domains of Life (1990). There was hardly an area of human inquiry that was not studied by Aristotle. 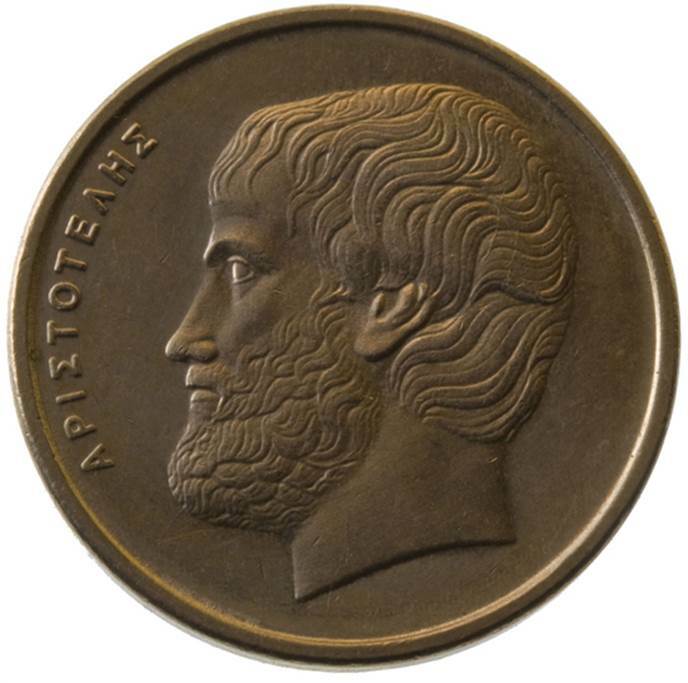 This photo depicts Aristotle on a 5 drachmas coin issued in 1990. The drachma was the standard monetary unit of Greece until 2002, when it was replaced by the euro.